Lately, nurse Monica Grant feels she’s being watched. Followed. And then she receives a threatening letter—accompanied by a dead snake. If she doesn’t stop her plans to open a free children’s clinic, she’ll end up dead, too. Terrified, Monica turns to former lawman Shaun O’Neill—who believes the same madman murdered his own sister five years before. She understands how much it means to the handsome, heart-guarding man to save her—and her dream. Even if he has to lure a deadly stalker out of the shadows—straight toward himself. It’s been a while since I read a Camy book, and honestly, I didn’t even know she had another book in the Grant sisters’ stories. It wasn’t until after I finished reading Protection for Hire that I found out, and I immediately got the book for my Kindle. In the third installment of Camy Tang’s Love Inspired series, Stalker in the Shadows, we meet the third Grant sister, Monica, a nurse with a heart for social work. With her trusty nurses shoes, she plans to open a free children’s clinic in their town, and she knows it wouldn’t be easy but it shouldn’t bethat hard either. Until she starts receiving threatening letters and “gifts” from someone who tells her that if she doesn’t stop her plans, she would end up dead too. Scared out of her wits, Monica seeks help from Shaun O’Neill, who believes that the same person threatening Monica was the one who caused his sister’s death. As the threats come and the stakes get higher, Monica wonders if maybe she should quit, while Shaun is constantly haunted by the thought of failing to protect Monica the way he felt he failed to protect his sister. 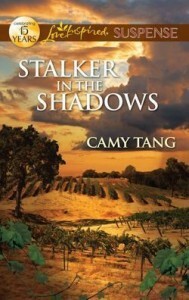 I haven’t read a lot of suspense or mystery novels lately so it took me a while to get inside Camy’s world in Stalker in the Shadows. I liked Monica right from the start, maybe even more than how I liked Rachel or Naomi. She was a level-headed and determined character, always putting someone else first before herself — her father, her investors, and even the children who will benefit with the clinic. I also liked her dynamics with Shaun, and I liked how Camy wrote him as a “heart-guarding man”. It’s not often we find heroes like that in fiction. :) There wasn’t much surprises in the romance (except, as always, for the first kiss! ), but it wasn’t too predictable, either. This book is probably the least preachy of all – and by that, I mean that the Christian aspect was shown more instead of being told. There were some God talk, of course…I don’t know how exactly to describe it, but it felt more natural when Monica realized things and Shaun realized things and they felt God more in their own realizations and with the things that happened to them. The climax felt a little bit too CSI-esque, but it was exciting enough for me to really fear for the main characters.